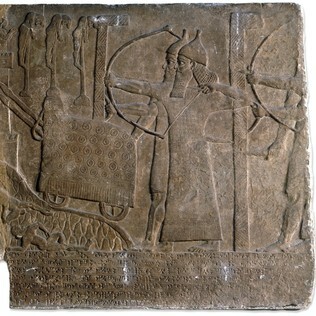 Assyrians storm a city in the reign of Tiglath-Pilser III (745-727 BCE). British Museum Catalogue number ME 115634; ME 118903. This photo is copyright of the British Museum and is used with permission. One of the collections of texts which I have been working with is a collection of texts associated with an Assyrian governor in the first half of the eighth century BCE (about sixty years before the relief above was carved). Aaron Dornauer has published a luxurious edition with sketches, a specialized sign list with the readings used in these documents, and detailed commentaries. Many more documents were written on clay in Neo-Assyrian times than under the Achaemenids, and because of the burning and abandonment of many Assyrian cities, a higher proportion have survived. It is therefore very important to study earlier periods to see what traditions the Achaemenids inherited and compare what is known in Achaemenid times. This weekend I will discuss one of these texts which deals with one of my interests, arms and armour. This text is No. 48 in Dornauer’s edition and comes from two fragments whose total size is 4.1 x 6.5 cm. Like many Assyriological collections it was excavated at the beginning of the twentieth century. I have written words which are written as logograms in the original with CAPITAL LETTERS.